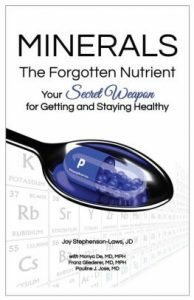 Minerals: The Forgotten Nutrient by Joy Stephenson uses great key topics discussing why minerals are truly the route for us to go to stay healthy. Stephenson goes into depth talking about how we need to stay on top of our health. In the book, there are fourteen top minerals that we need to maintain in our body on a daily basis. Some of these include Potassium, Chromium, Sodium, Magnesium and a plethora of other useful nutrients. It is a splendid resource in providing recommended daily intakes to get you started on your journey. It is supported with well cited references that the author had compiled for the book. This is a great book to use in discussing the importance of minerals and how they will help if you may have any chronic illness, injury or perhaps emotional health. It goes into great detail into what the average person needs to take for minerals and why you should take them. Stephenson goes on and finishes the book with why a routine doctor testing for minerals might be a good enough. It is an excellent way to convey what you should and should not due in the future when it comes to testing for minerals and what your next step should be.